Is there a preface and introduction on the online version of the book? Yes, the books are identical in content. A: Because overseas postage rates are expensive, and most of the companies you're thinking of that charge less have international warehouses they can ship from, or use bulk rate shippers due to the large volume of products sold. Ookoodook is a very small company that does not have those kinds of resources, so they have to bring them to the post office like everyone else. My research here is limited, so maybe this is old news, but my understanding is that these company's print-on-demand services allow for distribution in many overseas territories, as well as eliminating inventory costs? Give directly to the extreme poor. The price per copy for that service would be approximately three times what I pay in printing. That would lead to cover prices in the range of $40 for a book like this one and $80-90 for one like Blood Runs in the Family—for everyone, regardless of where they live—and they would also be using lighter, less durable paper stock (60# instead of 80#) and cover stock (10 pt instead of 13 pt) and a crappier printing method (digital, which leads to less rich blacks and ink that you can rub off with your fingers, instead of offset). You would be paying more for worse books, but I guess the shipping would be less. But it doesn't matter because I am not going to do that. I already said what I had to say about shipping in the FAQ, so I'm not going to say anything else. Thanks for the concise explanation. I think I'm just going to wait and buy the PDF in August. The price per copy for that service would be approximately three times what I pay in printing. That would lead to cover prices in the range of $40 for a book like this one and $80-90 for one like Blood Runs in the Family—for everyone, regardless of where they live—and they would also be using lighter, less durable paper stock (60# instead of 80#) and cover stock (10 pt instead of 13 pt) and a crappier printing method (digital, which leads to less rich blacks and ink that you can rub off with your fingers, instead of offset). CreateSpace is limited to 60lb, but looking at the shipping calculator for IngramSpark here, 8x10 inch full-color on 70lb paper works out at ~$6.20 per 100 pages in printing costs, or about $10 for Good Deeds. There might be other providers that go up to 80lb B&W. I can't speak directly to print quality, but my understanding is that PoD has largely closed the gap over the past few years. Either way, I would be surprised if this pushed a $25 book into the $40 range. Last edited by Lacuna Caster; 2018-05-04 at 09:34 AM. I can't speak directly to print quality, but my understanding is that PoD has largely closed the gap over the past few years. i.e., you just linked to an ad for POD. ...you just linked to an ad for POD. I think I might try setting up an account and see if I can print myself a few test-documents this way. In principle it shouldn't be that hard. The Giant's feelings about advising him on his business aside (I believe he generally disinvites it), this sort of thing feels like it'd be more suited to a PM than the new prequel book preorder and info thread if you still really want to say it. International Shipping costs will stop me pre-ordering, sorry, but I'm looking forward to UK distributors getting their copies of this so I can pick one up later in the year. *squee! I really enjoyed How the Paladin got his scar and have to buy this, if only because I've got all the rest! ;) But new OotS content is always good. [*]Pier Pressure: Teenagers Daesuk and Lien just want to hang out on the dock and maybe smoke cigarettes or something, but then things get, like, super weird. "It was for me. I was going to smoke the marijuana like a cigarette." Anyway, gonna preorder both, because I like having both and also doing whatever I can to support OOTS as a going concern. You can do whatever you want, but I already told you I'm not using print-on-demand. I know what options are out there. I have made the choices that work best for me. If you want to have a theoretical discussion about the quality of print-on-demand, go start another thread about it. This thread is about the book that will actually exist only. This thread is about the book that will actually exist only. Okay... well, in that case, I do have one or two questions about the O-Chul story. 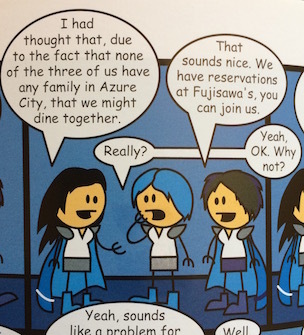 In HTPGHS, Miko and Hinjo refer to eachother as 'cousin', and a discussion between O-Chul and Hinjo implies that she had as much political influence as Hinjo, suggesting that Miko was formally adopted into Shojo's family. However, Miko in the main strip never refers to Shojo as 'father', never refers to her title as anything but 'samurai', has no particular wealth aside from her gear and 'a small stipend from my Lord', and retains her family name of Miyazaki, rather than Jo. Was Miko, perhaps, expelled from the royal household at some point? It occurred to me that the Miyazakis themselves might have been cousins of the Jo family in some capacity, but in that case, why was Miko left in a monastery for 13 years? Wouldn't one normally expect surviving relatives or retainers to take care of an orphaned child, particularly if they're as well-off as the ruling house? Was Miko, perhaps, expelled from the royal household at some point? It occurred to me that the Miyazakis themselves might have been cousins of the Jo family in some capacity, but in that case, why was Miko left in a monastery for 13 years? this does not mean she was a baby when orphaned, and that she was with the monks for 13 years. I've always felt that someone who had come to him with less underlying issues (whether due to her inherent personality or the trauma of losing her parents and getting sent to a monastery) could have been raised the same way and not turned out to be like Miko. Likewise, if Miko had never met Shojo, she probably would have left the monastery as an angry unstable loner with no purpose. Shojo's guidance was the tape that was held her together for so long, which is why she went to pieces when it was ripped off. Last edited by hamishspence; 2018-05-15 at 07:34 AM. I fail to see what this has to do with O-Chul's story. It feels even more off-topic than your previous line of inquiry. I believe his main doubt is in the lines of "They call themselves cousins in O-Chul's story. Are they blood-related cousins?" Last edited by D.One; 2018-05-15 at 07:39 AM. We're underdogs, but we rise up to the challenge to be heroes. "I really like the Geek Math'ology we do here"
...this does not mean she was a baby when orphaned, and that she was with the monks for 13 years. This is kind of secondary to my main point, though, which is that main-strip Miko doesn't show much sign of belonging to the upper nobility. She never, for example, says "You have no right to speak to me this way, I am a <duchess-equivalent>." Last edited by Lacuna Caster; 2018-05-15 at 08:00 AM. We'll just have to wait and see what, if anything, The Giant says in the introduction about Miko, Shojo, O-Chul, and the Sapphire Guard. I suspect something will be said, even if not a lot. She never, for example, says "You have no right to speak to me this way, I am a <duchess-equivalent>." She says almost exactly that. As presented in the story, Samurai is an earned military title, not an inherited nobility. Frankly, I think its more likely that Miko was simply discouraged from emphasizing her relation to the ruling family, both because it could theoretically cause issues of succession and because as a high ranking subordinate of Shojo, it could raise questions of favoritism. corrects someone who calls him the heir to Azure City by saying that being heir-presumptive is legally meaningless and until Shojo formally announces who his heir is, he's "just another apprentice consular." Miko's sole source of legal hard power is her samurai title. Being part of the Lord's family would give her tons of soft power--see the way Hinjo is the only person in the book who actually believes being heir-presumptive doesn't make him important--but Miko wields her authority way too overtly to actually use soft power. Last edited by Kish; 2018-05-15 at 10:15 AM. This didn't stop Hinjo from calling him uncle. It just seems odd to me that someone Shojo ostensibly adopted as a daughter doesn't receive any particular rank, wealth, name, or even the right to call him 'father' out of it. Maybe, she's attached enough to her original parents, that even if she has the right to call him "father" or "adopted father" she chooses not to do so and sticks with "Shojo" outside of "chain of command" situations. It seems to me that any political influence possessed by both Miko and Hinjo boiled down to "Shojo listens to us". That's still influence, even if you never make use of it--and Miko almost certainly never did, because she was supremely disinterested in politics as a whole. Actually, you know what? Never mind all that. Check out one of Miko's bonus strips in War & XPs. ...so, 'cousin' Hinjo and 'father' Shojo don't count as family here? Not in Miko's eyes, apparently. She may believe blood is thicker than water at this point. Last edited by hamishspence; 2018-05-16 at 08:54 AM. Forgive me, but that seems like a shift in outlook that requires a non-trivial explanation. Fiction is a place where you get to invent your own facts to fit your own theories. Is it asking so much that the facts are at least consistent? It's not a plot ole; at worst, it's a minor inconsistency that doesn't affect the plot. Or, like hamish said, Miko doesn't consider her status to be terrible relevant, especially as an adult. So.... do you think it'll be addressed in any of the stories in the book?